No glacier calving terminus, no horizon – we are enveloped in fog over a matte green sea and on grey rocks. 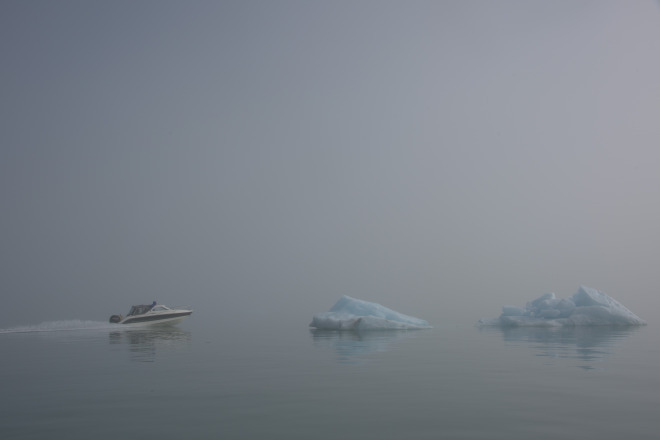 Right behind the sound of a four-stroke outboard motor, a boat materializes through the fog, cutting a delta through the thick water. It navigates as an aircraft on instrument flight might: its pilot looking intently at a small window of light through which the Global Positioning Satellites feed insight and clarity. A second boat joins. We jump in. We leave. Greenland is behind us but still around us – invisible. We race across the leaden waters, past ghostly icebergs, sending wake waves into each other’s path.